The new lease accounting rules have clarified that the investment tax credit is a component of lease revenue, but the FASB did not include any detailed guidance regarding how to account for it. Bill Bosco discusses the history of the ITC tax credit and provides an example of how to handle this complex accounting. Hooray! 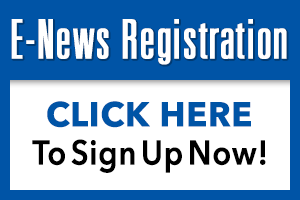 The new leasing rules, Topic 842, allow investment tax credit (ITC) to be amortized as revenue in a direct finance lease. You just have to weave your way through the words, connect some dots and interpret a bit to figure out how to do it, which I do in this article. I also assume that a tax grant in lieu of the ITC would be accounted for using the same methodology. Reporting ITC as a “grossed up” revenue item versus a credit to tax expense is a key issue for large financial institutions because equity analysts and investors look at net revenue from funds and operating efficiency ratios to compare financial performance. If the ITC is credited to tax expense, it distorts returns on earning assets and gets lost in the revenue analysis. As a side note, I have made some money over the years helping a few large-ticket lessors justify amortizing ITC in alternate energy leases with their auditors. I guess I have to revise my revenue forecast, as there should be no question going forward. First, thanks again to the FASB board and staff for formally stating that ITC is a component of lease revenue. From my recollection, only three comment letters asked the board to clarify ITC accounting for non-leveraged leases: my letter, the ELFA’s letter and a letter written by a coalition of large-ticket lessors supported by the ELFA but led by Ted Jenkins, now with PNC. The FASB staff read the letters and asked me for some background and explanations. I provided them with information, but I did not know how they came down on the issue until I read the final rules. Let’s look at the history of the issue. FAS 13 (Topic 840) explained how to account for ITC in a leveraged tax lease; that is, to treat it as a cash flow in the lease and to use the MISF yield (the after tax yield) to amortize it as a component of lease revenue. Topic 840 was silent as to ITC accounting for non-leveraged tax leases. Lessors used leveraged lease accounting by analogy but used the pretax implicit rate in the lease to amortize the ITC as a component of revenue. The Big 4 endorsed that practice and included it in their lease interpretations guides. ITC was suspended in 1986 for all asset types, so the industry and accounting profession lost their intuitional memory of the interpretations. With the reinstatement of ITC for alternate energy assets in 2006, ITC accounting became an issue again, but it was not a pervasive issue because it affected a limited number of leases. The credit is 10% to 30% depending on the type of alternative energy asset, with 30% being the most common as it applies to wind and solar assets. The Big 4 were not consistent in allowing amortization of the ITC as revenue, so it often became an issue to be defended and supported with evidence of practice from the 1980s. Guidance for ITC accounting is sparse in the new rules. Here is how I weave through the new rules to find the roadmap to ITC accounting in a direct finance lease. 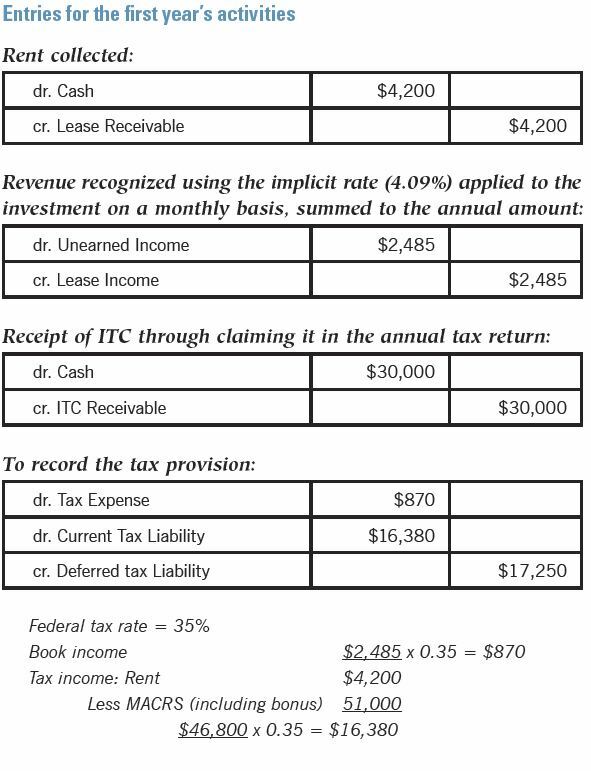 The definition of the rate implicit in the lease includes “any related investment tax credit retained and expected to be realized by the lessor.” The rules do not include an example of the initial entry to record a direct finance lease with ITC or the subsequent accounting. 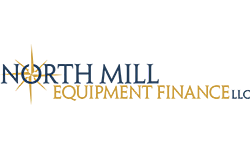 The rules state at the commencement date of a direct finance lease that a lessor should recognize the net investment in the lease and derecognize the underlying asset. The net investment is defined as the discounted value of the receivable and unguaranteed residual. For a lessor, the discount rate for the lease is defined as the rate implicit in the lease. A lessor should determine the interest income on the net investment in the direct finance lease in each period during the lease term as the amount that produces a constant periodic discount rate on the remaining balance of the net investment in the lease. The ITC must be part of the revenue in the direct finance lease for the math to work. The implicit rate in the lease where ITC is an element is applied to the net investment in the lease. That net investment reflects the netting of ITC as the implicit rate in the lease is used to discount the receivables and residual. According to my interpretation, a lessor will record a rent receivable, residual and ITC receivable as assets and record a cash disbursement to buy the asset with the difference credited to unearned income. ITC is a tax credit, so it results in a permanent book versus tax difference. The IRS tax rules also require that the lessor reduce its depreciable basis in the asset by half of the ITC amount, creating another permanent book versus tax difference. It gets more complicated when you consider the book versus tax timing differences created by the differences in accounting for direct finance leases that are true leases, as for tax purposes you must use operating lease accounting. 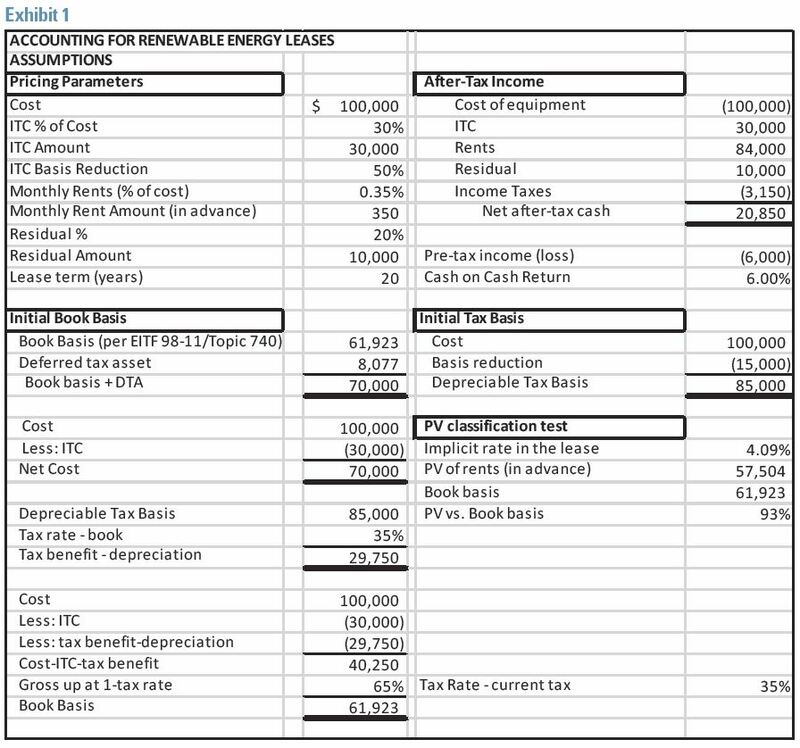 Accounting for Income Taxes (ASC 740) covers the accounting for the book tax differences and uses complex simultaneous equations illustrated below. 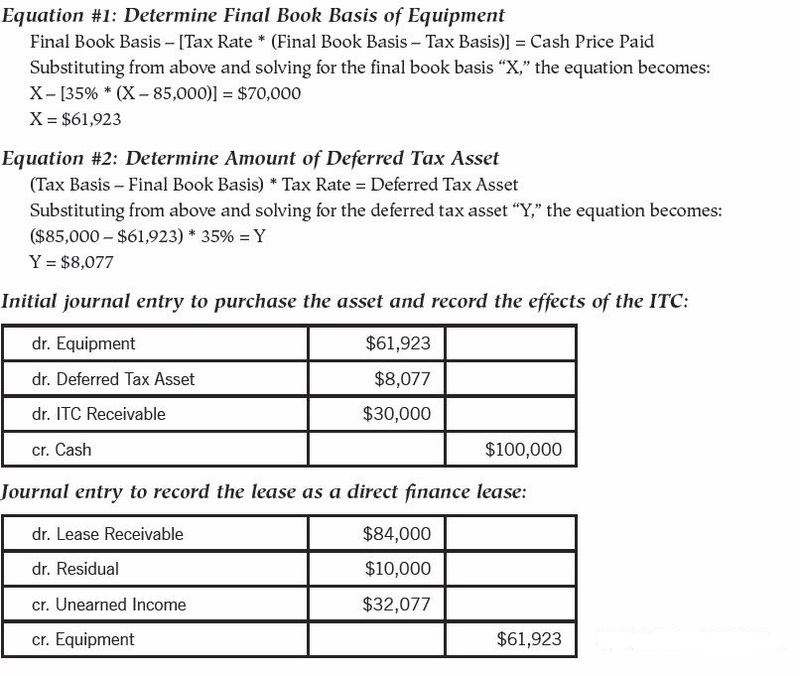 To account for the book tax differences, a deferred tax asset is recorded at lease commencement. The deferred tax asset is the difference between the book basis and the tax basis of the asset grossed to a pretax equivalent using the lessor’s income tax rate. The grossing up of the basis is necessary to result in a normal relationship between the tax provision and pre-tax accounting income. This presents the ITC revenue on a grossed up basis, which is how a lessor considers ITC in pricing a lease. Since this is so complex, an example is needed (see Exhibit 1). Rod Hurd, Deborah Brady and Joe Sebik of the ELFA accounting committee helped with this example and article. The example does not include state tax effects. The lease in the example is a direct finance lease as the present value (PV) of the rents, in advance, using the 4.09% implicit rate in the lease is 93% of the book basis (the ITC expected to be realized is a subtraction to arrive at the value of the equipment for purposes of the “substantially all” present value of lease payments lease classification test) as calculated under the Topic 740 methodology. In many alternate energy leases with tax credits/grants, lessors may need to buy residual insurance to achieve direct finance lease classification. The asset’s cost is $100,000. The ITC available is 30% of asset cost. 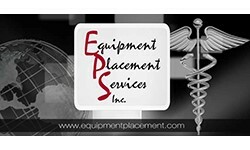 Therefore, in effect, the cash price paid by the lessor is $70,000 ($100,000 cost – $30,000 ITC). IRS rules require a basis reduction of half the credit, so the tax basis of the asset is $85,000 [$100,000 – (30% * $100,000) * 50%]. The lessor’s tax rate is 35%. The good news is the FASB listened and allows for ITC/tax grants to be accounted for as lease revenue under the new rules. The method illustrated above also grosses up the ITC portion of the lease revenue to its pretax equivalent. This helps portray the substance of ITC in a direct finance lease as a lease cash flow and lease revenue item — not a credit-to-tax expense. It helps users of financial statements to understand the “economic” revenue created by the leases. The downside is the FASB did not include any examples or detailed guidance covering ITC accounting in the new standard. As a result, we have to interpret. Another flaw is the complexity in the accounting because of the permanent and temporary differences. Maybe the bright side of the negative aspects of the new rules is that you need to have smart accountants and systems people on staff, and they will deserve a raise to deal with the complexity.